The UN climate discussions in Lima crossed the finish line at a few minutes past 3AM this morning, with all countries agreeing to shoulder climate commitments in an agreement to be finalized in Paris next December, but with commitments that will be of their own choosing. “The Lima agreement sets the table for Paris, but the deal will be meager indeed unless it is expanded to include fast mitigation from other available laws and institutions outside of the UN process,” said Durwood Zaelke, President of the Institute for Governance & Sustainable Development, who attended the negotiations in Lima. The UN climate process has been unable to motivate countries to show sufficient ambition to solve the fast growing climate challenge and keep temperatures from rising beyond the 2°C guardrail above pre-industrial levels. Nonetheless, the 2015 agreement will be an important platform that allows parties to get started in 2020, when the agreement would go into effect. “A start-and-strengthen approach is far better than the slow dance we’ve been doing around the world these past many years,” Zaelke said. 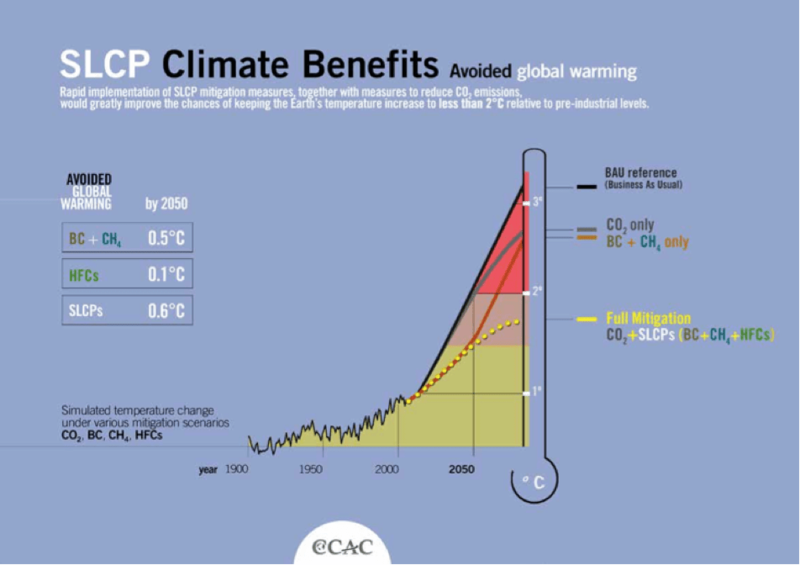 “The biggest and fastest near-term mitigation opportunity is to cut ‘short-lived climate pollutants’—black carbon, methane and tropospheric ozone, and hydrofluorocarbons, or HFCs,” Zaelke said. “Cutting these pollutants using existing technologies and existing laws and institutions can cut the rate of warming in half, and in the Arctic by two- thirds in the near-term. This will avoid up to 0.6°C of warming by 2050, compared to avoided warming of 0.1°C at mid-century through an ambitious effort to cut CO2. By end of century, cutting the short-lived climate pollutants can avoid up to 1.5°C of warming, comparable to aggressive CO2 mitigation.” Zaelke quoted from a publication he wrote with Nobel Laureate Mario Molina and Professor V. Ramanathan, at Scripps Institution of Oceanography, University of California, San Diego, “As Climate Impacts Accelerate, Speed of Mitigation Becomes Key,” See also Figure on next page. President Obama’s climate détente with President Xi of China started with a series of agreements on HFCs negotiated with President Xi, beginning last June at their first meeting in Sunnylands California, where the two presidents also agreed to work together on North Korea. More recently President Obama reached agreement with Prime Minister Modi of India to use the Montreal Protocol to phase down HFCs. At the annual Meeting of Parties last month in Paris, donor countries agreed to put $507.5 million into the Montreal Protocol’s dedicated funding mechanism, and to hold an extra meeting next April to address HFCs, along with the regular meetings in July and November 2015.
opportunities, including the Montreal Protocol and the Climate and Clean Air Coalition to Reduce Short-Lived Climate Pollutants.” The Coalition was started by the U.S. and a small group of allies two years ago, and now with 100 partners, including nearly 50 countries, divided fairly evenly between developing and developed. Signaling the growing importance of the short-lived climate pollutants at the Lima negotiations, more than thirteen events highlighted the importance of fast action to cut these pollutants. Zaelke spoke at several, including at Potent pollutants: Addressing Near-term Climate Change Through SLCPs, and at another at the Peruvian Supreme Court. Source: Climate and Clean Air Coalition to Reduce Short-Lived Climate Pollutants (2014) TIME TO ACT, at 22.